Australia, 2013, 96 minutes, Colour. Anna Broinowsky, Peter O’ Brien, Matt Zemeres, Susan Prior, Kathryn Beck, Elliott Weston. Aim High in Creation is a very interesting film as well is an entertaining one. And it is quite ambitious in its scope. Anna Broinowsky is a Sydney documentary filmmaker, well-known for her expose of a fake Middle Eastern story in Forbidden Lies. Faced with the possibilities of fracking and exploration for coal seam gas, especially in Sydney Park, she decides to join protests, and to make a film to persuade people against fracking. The plan is to make a short propaganda film that will move all audiences to action. Discovering a manual for filmmaking, written by the leader of North Korea, Kim Jung Il, with its five principles for filmmaking, highlighting emotions, images, music and a propagandistic appeal to audiences, she decides to go to North Korea to consult with the local industry. One of the advantages of the visit and permission to go to this isolated country is that the audiences have a chance to see the country itself, the cities, the film industry, as well as meet various people, especially those in the film industry, one of the fastest in the world, all very agreeable. 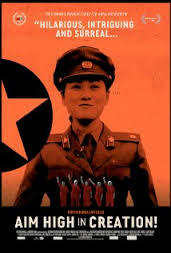 In Korea, she has the benefit of being advised by two of the most prominent directors, one a favourite of the Dear Leader, as well as his favourite actress and his favourite musical composer. As the audience listens to them and watch their films and put their principles into action, and we realise that the sensibilities are very, very different. In the meantime, she has chosen local Sydney actors to participate in her short propaganda film. They have the opportunity to look at the footage of her interviews in Korea, to see them put into action the sequences in her intended film. The mother in the film, played by Susan Prior, is advised to wear a scarf to work, overalls and a set of tools around her waist. And a Korean composer gets an orchestra to play his song and communicate his poetic and sometimes down-to earth lyrics (including the fact of putting manure on the gardens). The daughter in Anna’s film, played by Kathryn Breck, watches some tae kwon do practice, with three versions of how the fight for the film might be done, tough martial arts stuff. Also in the Australian cast is Elliott Weston as the husband and musician, Matt Zemeres is an engineer working for the coal seam gas company and Peter O’ Brien as the villain, the executive heavy. Their Korean counterparts rehearse in a variety of scenes. And we see the director urging his performers to do some running awesome exercises to release energy for their emotions in the performances. Finally, the film is made in Sydney, using all the advice from North Korea – which, of course, to local audiences is more on the hilarious side rather than the social protests side. Cultural sensibilities are quite different – though the audience in North Korea, watching it on the computer, think the film was a great success. There have been very serious films about fracking, including the two Gasland documentaries. There is also the feature film, The Promised Land, written by and starring Matt Damon and John Krasinski. But with its novelty, Aim High in Creation, will probably stay in people’s memories – its inventiveness and its humour reminding people of an important cause. 1. A creative idea? Ambitious? A film against coal seam gas and fracking? Decisions made about making a propaganda film? Enlisting the help of North Korea? 2. The director, her career and work? 3. The choice of North Korea, audience attitudes towards this country, its isolation, unknown? The visuals of the city, modern, public buildings and their size, scope, style? The studios? The bowling alley? The audience having an experience of North Korea? 4. The cult of Kim Jung Il? From the 1930s, closing North Korea, Communist rule, socialist attitudes, the importance of the party, Rigid, puritanical, attitudes towards the rest of the world, towards Asia, told South Korea, the United States? 5. North Korean movies: the clips, visual impact, plots, characters, situations, emotions, songs, propaganda? Rousing the people to support the cause? 6. The manual by Kim Jung Il? His interest in movies, his vast collection of American movies, his urging remakes of American movies? Adherence to his manual? The two directors in the film, the old and the new, his favourite actress, composer? His control of productions? The propaganda aimed within North Korea and outside? 7. Anna, her life in Sydney, the coal seam gas, the variety of companies exploring, the map and the vast amount of the exploration on the east coast of Australia, the emblems of the companies, and not responding to enquiries? Sydney Park? The protests? The badges? Anna distributing propaganda with her daughter, the daughter’s response? The idea for the film? Perfect propaganda to win and promote the cause? The manual, the decision to go to North Korea, its reputation, the idea for consultation about the film? Her packing – and the range of prohibited objects, including mobile phones, from Korea? 8. Travelling to North Korea, the capital, meeting the various personalities, the role of the translator? The interviews? The director and his advice? The cast and the director, emotions, exercises to release energies for performance? The two different directors and the sequences from their films? 9. The composer, his role in the past, the Deer Leader urging changes, melodies that can be learnt? The lyrics? For Anna’s film? Poetic and ideological – including the manure for the garden? 10. Beginning with nature images, eliciting emotions, the music? 11. The Sydney group, the introduction to each, their watching on the computer the film from North Korea? The discussions, the rehearsals, interviews? Karen as the mother, Sally is the daughter, Peter O’Brien? as the promoter, Elliott Weston as the husband and composer, Mitch and his being an assistant to the company? The personalities of the actors? Their interactions? Rehearsing together? 12. The Darlinghurst sequence, the stand promoting fracking, the people coming by, balloons and sweets? 13. The insertion of the discussion with the farmer from Dalby, his explanations, emotions, the illnesses of his children, the visuals of the burning of the gases, the methane in the mud? 14. The tae kwon do, the three fights visualised from Korea, the group watching, the rehearsals, Korea, the rehearsals in Australia? 15. Anna and her film, in Korea? The sequence, the actors, the Navy, protecting the island? Her going to the bowling alley, the explanations, the many takes, her fluffing the scenes? 16. Filming in Australia? In the Korean style? 17. The film, the Gardner, Karen, her scarf and the tools on the advice of Korea? The imagery of the flowers, her planting? Her flower design? The flashbacks, overhearing the plotting about the fracking and the tunnel? Her husband in the song, walking through the streets of the suburb, the shopkeepers looking? Sally, tae kwon do, the encounter with Mitch, falling in love, her mother and the protests, Sally at the meeting, denouncing her mother? The meeting, the executive and his speech, his lies? The parallel sequence with the South African promoter in real life? Karen, on the hill, the shopkeepers giving Sally flowers for her mother, her putting in them in the garbage, her discovery of the truth, spurning Mitch, the crowds, the speeches, the fight, Triumph? 18. The North Korean seeing the film and being happy with it? 19. The film highlighting the propaganda film, its preaching, its blatant appeal, not an Australian sensibility? 20. The final comments on the film not winning the cause, the fracking continuing, but not in Sydney Park?